SOUTHERN AUTO is pleased to present this DirtCrimes Performance 2017 CUSTOM Jeep Wrangler Unlimited 4X4, Big Bear Edition. The Jeep Wrangler is an authentic American original. For its loyalists, it’s nothing short of Old Glory with 4-wheel drive. Still true to its original concept after 75 years, the 2017 Jeep Wrangler continues to deliver exceptional off-road capability. Any Wrangler can get it done off-road thanks to solid axles, generous ground clearance, short overhangs, and terrific 4-wheel-drive systems, but this Wrangler is ESPECIALLY perfect for off-roading as it is the Upgraded Big Bear Edition and covered from top to bottom in impenetrable BulletLiner. 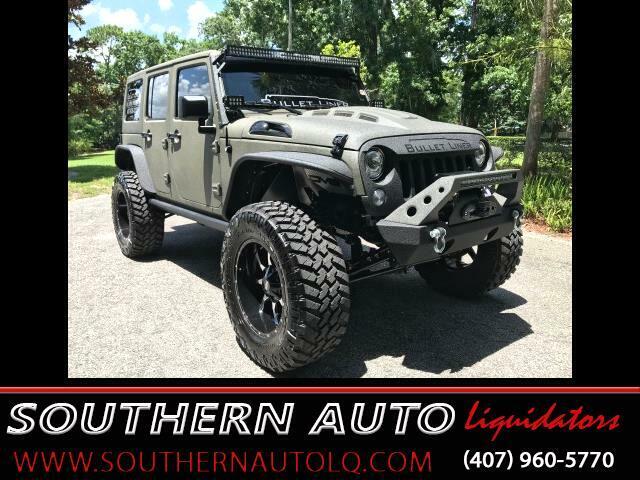 This Wrangler comes complete with all the most desirable factory options, plus the Big Bear Upgrades and has received over $40,000 worth of Customized Upgrades! Equipment includes: BulletLiner on interior and exterior surfaces with custom gun metal color on exterior, connectivity package, bluetooth audio & phone, Sirius/XM Connection, Hard top option, 3-piece hardtop with removable front targa panel, power windows/locks/mirrors, remote keyless entry, 3.6L Pentastar V6 engine, 5-speed automatic, and much more. The off-road capability of this vehicle is second to none, and with the edition of superior BulletLiner, this car is practically untouchable. There is absolutely nothing else on the road quite like this Wrangler! Bullet liner on interior and exterior surfaces with custom gunmetal color on exterior.